BoJack Horseman Season 4: Knock! Knock! Who’s there? BoJack Horseman! I am not joking here. This is absolutely true. The wait has come to end. Season 4 of ’BoJack Horseman’ is about to come. The black comedy is about to give a look on our TV sets soon. A more astonishing fact is that there are some hints about the discussion of season 5 by the team. Boost up your excitement as this time it’ll be more drama to see. The American satire seems to be one of a remarkable work by Raphael Bob-Waksberg (the creator). Thinking about the release date and stuff? It’s obvious to see your excitement for the show! Let me do the honor of telling you about the BH s4 premiere date. There’s a good news for you’ll. The release has been confirmed. It will fall this year itself. Netflix would be captured by all brand new episodes of ‘BoJack Horseman’ on September 8, 2017. Start making your plans to view the sequel. Waiting to see BoJack Horseman season 4? Talking about the tale there comes up one character in mind- BoJack Horseman. Will Arnett added stars to the character by his voice. Have you seen any horse that speaks? Strangely, not in the real world. But the show seems to have a talking horse. What a fun it would be seeing a horse that speaks! There was a time in the 90’s where the horseman got the high spot and was regarded as a big name in the family sitcom, Horsin’s Around. Currently, he wishes to return to the high spot again. This time he’s got to deal with the world full of humans and statesmanlike animals. See: Star Wars Battlefront 2. The character revolves around and around comedy. Plus, there come some massively difficult stages for the horseman. What stages may it include? Well, talking about humans the big thing is existence and demise. To our hopes, we’ll get to see more drama, more comedy this time. Talking about the promo or the trailer, I’d like to mention that it’s out. Yes, Netflix just gave light on the trailer for the show. Season 4 gonna be much more interesting than before. New things, new issues, new modes would be seen this time. This might raise up your Curiosity. Now, what are you’ll waiting for? Go, get a look at the trailer! The stars added life to the cartoon characters by their voice. Talented comedians showed their best efforts to make it look amazingly superb and real. The Horseman’s part is well played by Will Arnett. He thinks that the Horseman character is one which seems to get both kinda reviews- Positive and negative. Some may feel elated for the Horseman. On the other side, some people may show criticism towards him. How can we forget the roommate! Aaron Paul played the part of Todd Chavez, the roommate. Amy Sedaris acted as Princess Carolyn. Diane Nguyen part was well performed by Alison Brie and Mr. Peanutbutter part by Paul F. Tompkins. What’s gonna happen in the story of BoJack Horseman so far? Much news and updates aren’t shown yet about season 4. But as such for now, we can join some clues or hints left by the team. The last season gave light on the Bombshell falls. This time there are chances of getting more into the falling of Bombshell. There seems to be a moment of blush for the creator of the show. None other than Raphael Bob-Waksberg. He’s not revealing much about the show which means he wants to raise up our curiosity level further. Little little we got his signs and concluded that season 4 would be politically molded. This is new to the on lookers. Since the earlier seasons got cast before the election period. This time elections are yet to be held and so some views could be thrown in the new season about politics. This seems to be one of a new thing yet to be viewed. So, season 4 gotta make us feel thrilled. There’s something unique about the show which easily catches up our eyes. The theme is based on ‘BoJack Horseman theme’. A completely new thought of capturing a speaking horse. Many shows have come up with different themes. But this show is something based on a wholly new concept. A more astonishing fact is that the sequel is an animated one. Cartoons characters just easily gather all attention. 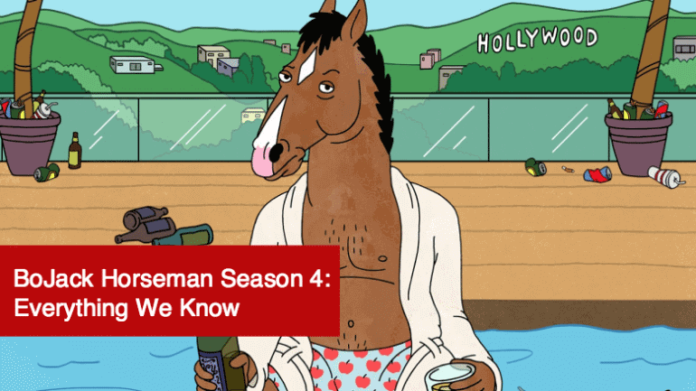 The focus basically lies on BoJack in the show. All in all, it’s a mixture of black comedy, drama, satire, and animation. All these features in one show make it a blockbuster one! Excited for the show? I am just waiting eagerly to get a look at the new season. Plus, added pop-corns for the show. That seems to be funny. But season 4 gonna be amazing. Stay tuned to TheReporterTimes for more updates on the show and all entertainment news around the world.